This responsive WordPress Event theme comes with powerful built-in features for a professional event portal. Events come with “1-click-setup’ so you can start your events portal website in no time. As with all of our event themes, you get sample data with a click of a button. Once you activate Events, pressing the button to install the sample data will get your site to look like its demo. 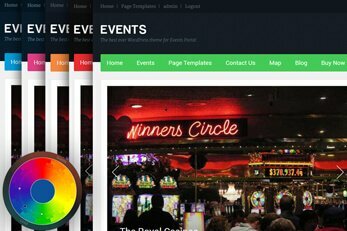 As well as being able to create regular events, this responsive Events theme also comes with recurring ones too. Set a global start/end date and then define the occurrences. 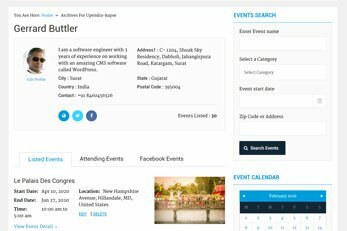 In case your events portal needs to be user-driven, Events has got you covered. Not only can you enable user submissions, you can also monetize submission by creating custom paid event submission packages. Change the look of your events portal with easy as drag n’ drop. Widgets allow you to change the homepage with different content. get your website to look the way you want and it’s all done from the dashboard. To make events easier to find you can use maps. Maps are shown on event detail pages by default. 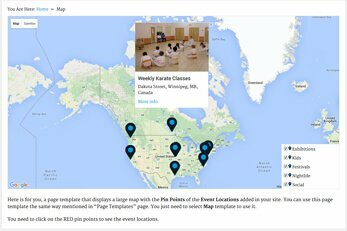 You can also create your own by using the included map page template. Each field you see inside the event submission form can be modified from the theme’s extensive back-end section. Creating new ones is possible as well. Using third-party plugins such as OA Social Login you’ll be able to provide an alternative login method to your visitors. Pulling events from Facebook is also possible. Events comes with a language file (.po) you can use to translate the theme. In case you haven’t done this before we’ve prepared a tutorial that will help you get started. Both you and your visitors will have an option to confirm attendance of a particular event. Each event selected as attending will be visible inside the user front-end dashboard. This powerful WP Event theme doesn’t hasn’t just been designed for event portals. 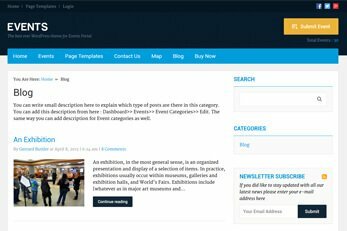 You also get a built-in blog with the theme in case you wish to also run an events blog or to promote anything event-related. The Events theme comes with a powerful built-in customizable submission package system. You can create your own packages and even offer coupons in case you wish to offer discounts on event listing submissions. Presenting the easy to use, flexible and multipurpose WordPress Events theme to create your event’s website. This is an ideal Event WordPress theme for conferences, exhibitions, conventions, ceremonies, parties, music concerts, event directories, startup events & management companies. 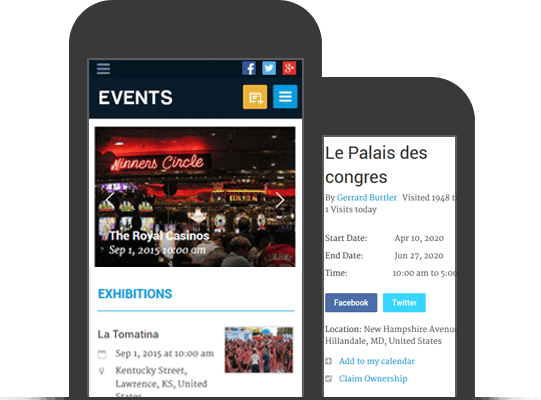 The individual events listings on your events WordPress theme, are detailed and can act as an agent to increase the keyword volume on your website. Moreover, there are the social sharing options on the event listing page, that enable an interested visitor to easily share your page. If you are not a programmer, creating a website means spending thousands of dollars on programmers and designers and struggling with site maintenance and upgrade every time you need minor changes. On the other hand, even if you are a programmer, developing an events portal may take a lot of time and efforts. Therefore, this WordPress events theme is designed keeping the ease of use and flexibility in mind. You can get started with your events website in just minutes. You can adjust every feature of your website with easy intuitive options available at the backend of your website. This WordPress event management theme provides you with multiple ways to monetize your events website. This events WordPress theme comes with PayPal integrated so you can start collecting payments right away. Moreover, you can also opt for offline payments. Besides, there are a number of payment gateways that you can integrate with your events website to accept payment through your events website. Create as many payment options you want. Create payment packages for front-end event submission is really easy. All you need to do is to specify details like price, a number of submissions allowed under that package, the validity of the submitted listings, etc. Moreover, you can also create a category-specific submission package. So the users who want to submit the listings on your website can simply choose a payment package based on their requirements, make payment and submit their event on your website. This WordPress theme helps you create, manage and monetize a professional events directory site for literally any purpose. You can customize the event categories, submission packages, add custom fields and also change the text around the theme. This feature-packed events theme is designed to be used for any type of events. By adopting the theme, you can use it for nightlife events, conferences, speakers, workshops, classes, sports events or absolutely any type of events you like. 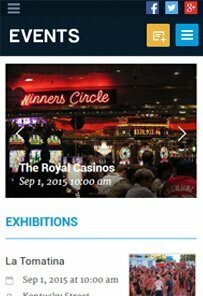 This events portal theme is responsive so whether visitors to your events portal view your site from a mobile device, touch pad, laptop or any desktop computer, it will look great. This responsive design means your site gets a low bounce rate and better position in Google search results. Want to see how the Events theme looks? Take out your mobile and give this theme demo a try. Your events directory can help you earn by displaying advertisement. The events WordPress theme comes with special ad widgets to display advertisements in different sections of your website without affecting its good-looks. The event widgets blend into your websites’ design. You can make money by simply displaying advertisements banners (In form or images or videos) from your sponsors, or by subscribing to advertisement services like Google AdSense. The homepage of your WordPress events theme is flexible and you can easily change it to show the content you want to. The homepage is completely widgetized. All the widgets give you the power to restructure your event portals home page. You can move the widgets in and out of the different homepage widgets areas and rearrange them as per your requirements. Also update your footer with the widgets of your choice. You can even add some social networking icons there to connect with your audience. 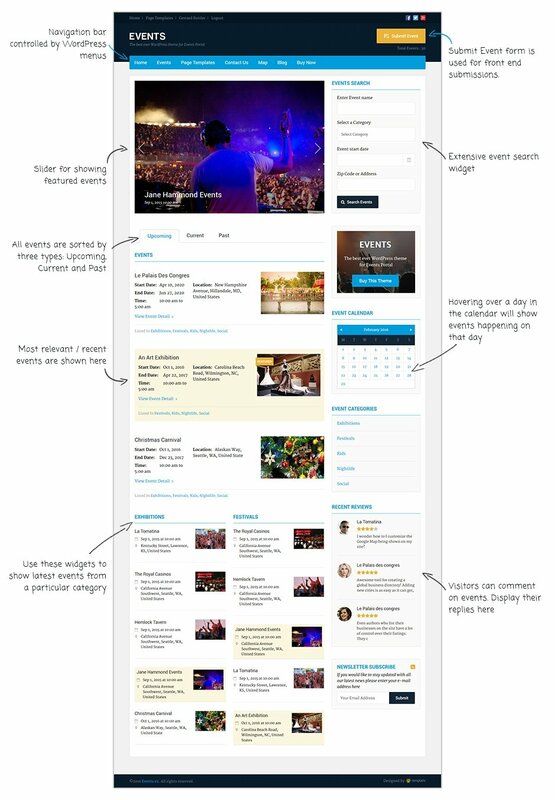 The WordPress events theme is totally customizable. Change color, fonts, and background of your site through the WordPress live customizer. So you can see the preview of your new settings before you save them. Besides, you can edit the pages and change the sidebar and other sections by changing the widgets. You can even use the custom CSS for advanced customizations. The WordPress events theme comes with the feature to let you create recurring events. Meaning, you can set a recurrence date for events. Set a global start/end date and then define the occurrences. Based on the recurrence period, the events will be renewed on their own. Therefore, you can just key in the recurrence period, and the rest of the calculations and procedures of re-publishing the events, updating the listing will be automatically handled by the events theme. 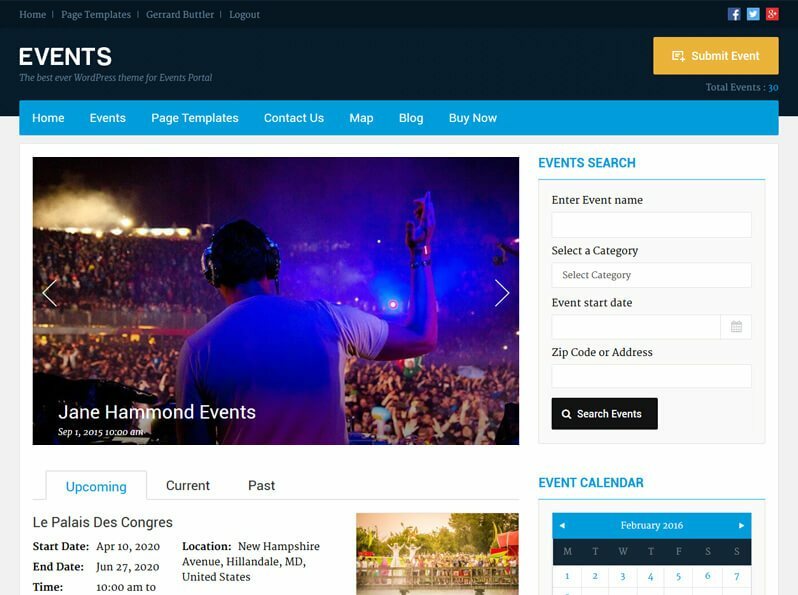 Loaded with functions for admin, users, and event organizers, Events is also a stylish, powerful and responsive event calendar WordPress theme. Users can browse events on the calendar with a simple mouse hover over any of the calendar’s dates. What makes this theme the best event directory theme is the advanced search widget to search events with different options. Users can easily search the events by events date, events category and events location. So the users can easily find the nearest event on the particular date. 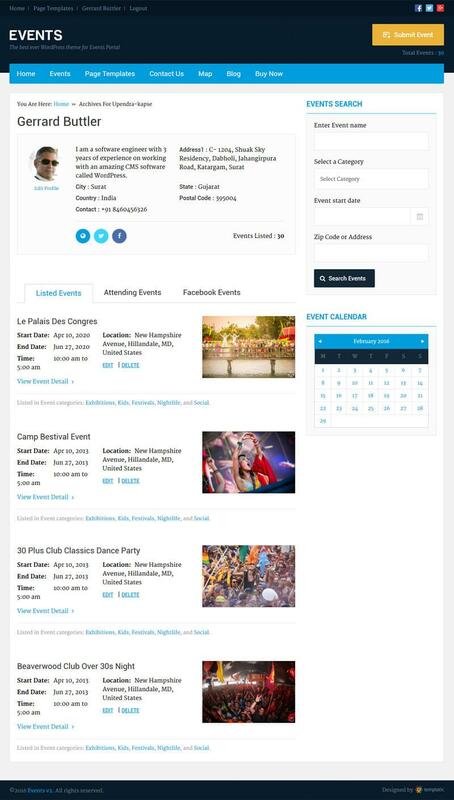 All event listing pages feature three tabs for easier navigation, “Current, Upcoming, and Past“. Sort events in multiple ways. Provides you an option of adding an event to your calendar on the event detail page. Uses 4 built-in calendar options to add in any event. This theme is designed to be SEO friendly to ensure your events website gets maximum online exposure. Events also supports the best, free SEO plugins available today such as WordPress SEO, All in One SEO, Google XML Sitemaps and All In One Schema.org Rich Snippets . By utilizing free plugin like All In One Schema.org Rich Snippets, you can really take your events site SEO to a new level. The front end event submission module of this Events WordPress theme is designed to create a flawless submission process. 1) Easy users and listing management for submitted listings. 2) Easy submission for the front end users. The Events theme comes with the easy front-end submission form, with customizable fields. You can edit and update the existing fields for your events listings, or add new fields by creating custom fields. 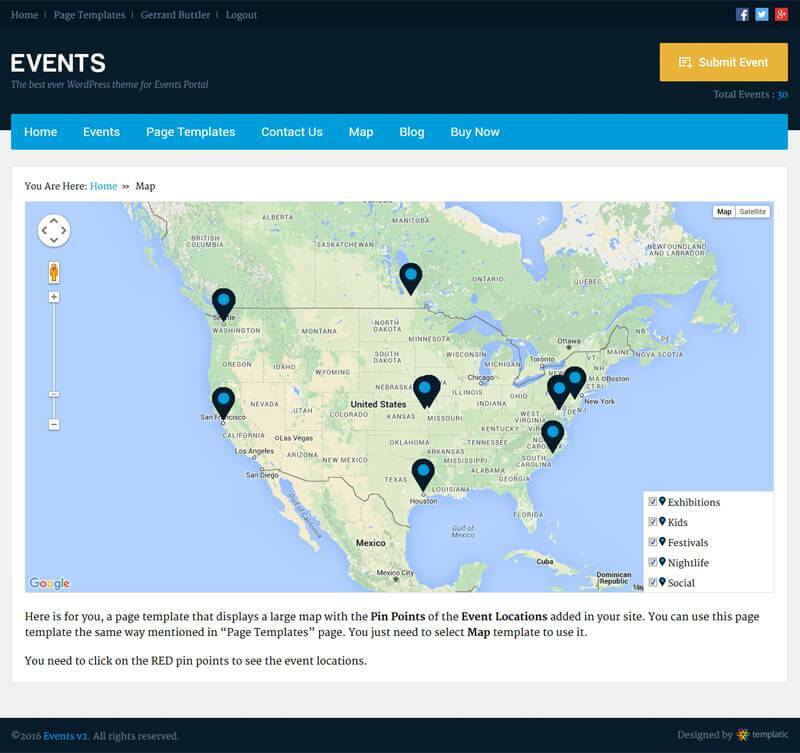 1)The events WordPress theme comes with responsive Google maps included displaying the event’s location. 2) The maps on events detail page offer navigational features. This can be really helpful for your users to get directions on Google maps and easily reach the destination. 3) Also, the full-screen map page for event listing shows all the events listed on your website with map markers. And yes, you can set different map markers for different event categories for easy identification. Moreover, the map page can show filtered results based on your choice, eliminating the event categories you are not interested in, and showing just the categories you are looking for. One of the main question for event organizers and event portal owners is how to promote their events. Coupons and discount codes seem to be the easiest and quickest way to promote your events. Therefore, this events website template comes with an inbuilt coupon module. With this events directory coupon module, you can create and manage coupons on your website. Get your sponsors to promote your website by distributing coupon codes for your events. You can create event codes with exclusive discounts and name. This will surely inspire your end users to save money and interact with your website and. When we say that you can get started on your event’s website in just minutes, we mean, a fully functional and feature rich events portal. An events portal that is ready to accept front-end event submission. Therefore, the events management theme comes with a ready to go event submission form. This form is already crafted considering all the important fields required for a complete event listing. However, if you want your event listings to have more or fewer fields, you can easily do so. Create the custom fields or update the existing ones. You can create custom fields based on the events categories. For example: In an educational event, wouldn’t you like to have the field for “Speaker”, or in a musical event, a field called “Performer”. You can even rearrange the fields, based on how you want them to appear on the listing submission form. It is all possible through the Flexible event listing theme. With this events management theme, you can create an event portal with free and paid event submission in just minutes. The events WordPress theme comes with a fully functional user registration and front-end submission system. A few settings and your website can start accepting front-end user registration and submissions in a matter of moments. 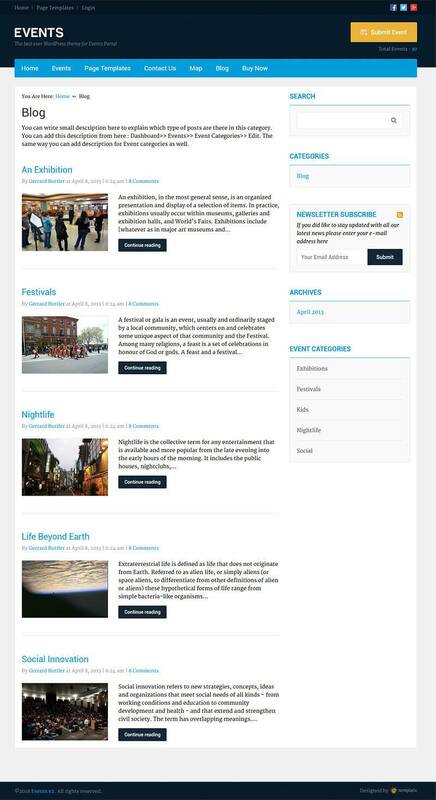 Besides, with the available backend options, you can easily manage the users and the submitted events listings. You can easily edit, update, publish or unpublish the user uploaded event listings under different categories. 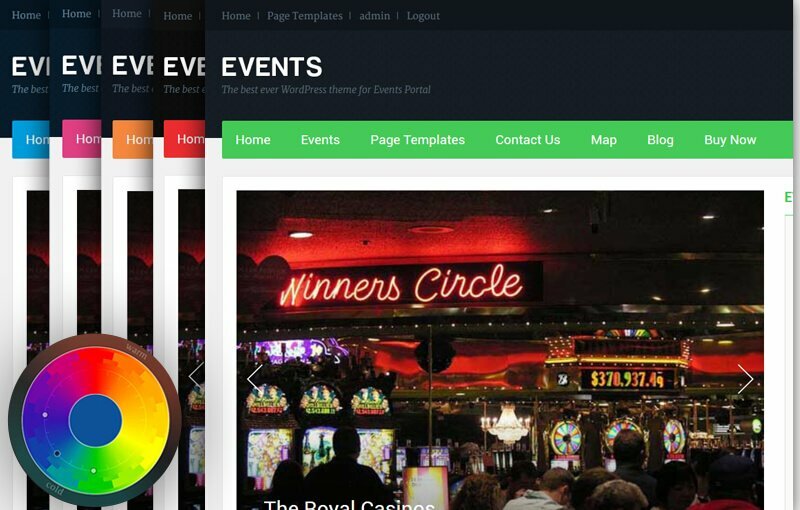 This events manager theme has been tested with the popular WPML plugin. This compatibility lets you use the events theme for multi-lingual portals. You can also translate the theme into any other language instead of English. Translating Events is done with the provided .PO and .MO files, the WPML plugin is not required for this. You can customize this with your ways, easily customizable color settings are in backend customization, Just change color from customizer and visit your front end. You will get your site ready with the choice of your colors. 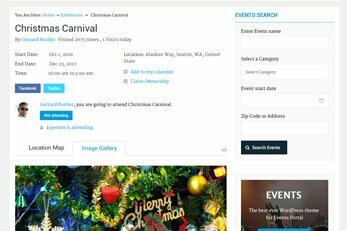 This event management WordPress theme provides you an option of adding an event to your calendar on the event detail page. And the event calendar can be placed anywhere on your event’s website using a widget. 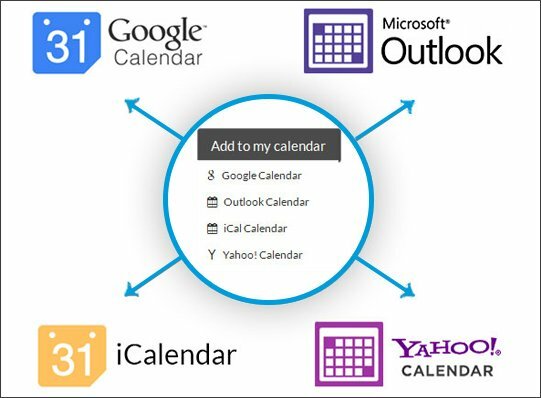 Besides there are 4 inbuilt calendar options: “iCal Calendar”, “Google calendar”, “Yahoo Calendar” and “Outlook”. Choose the one you like, and make it easier for your visitors to find events based on dates. Events theme is a complete event management system. All you need to do is to specify the validity period of a listing at a fixed price for a particular pricing package. The listing submitted by a front-end user will be automatically unpublished (and saved as a draft) upon the validity expiration. Moreover, the system will send an automated reminder message prior to listing expiry date. You can easily edit the email template, and when the email will be sent. Therefore, no manual labor to maintain your events portal. 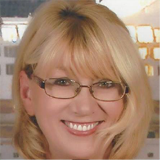 Let your visitors easily find what they are looking for. This events software comes with easy search and advanced features. 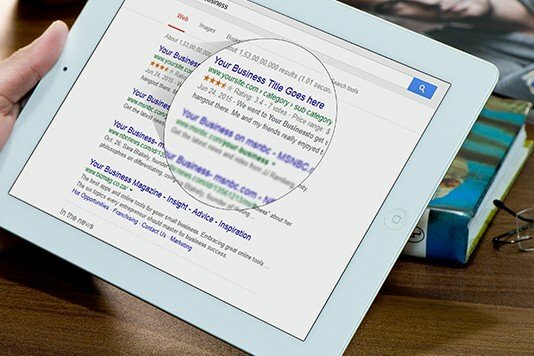 Therefore, your site visitors don’t need to waste time, and directly find the listings of their interest based on the filters used. First of all, you can create all the event categories you want and showcase them with a mega menu. Also each event category can be therefore easily searched with the event category page. Moreover, you can set different prices for submission under different categories. 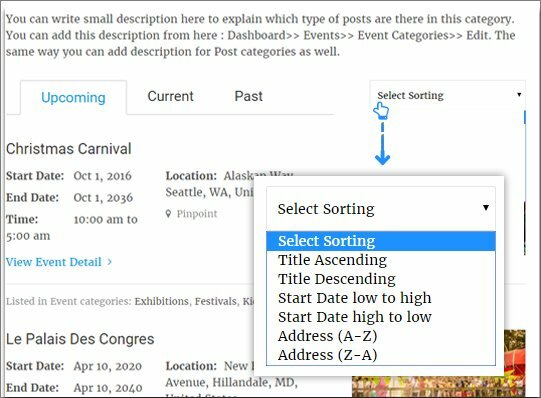 The event categories accelerate search, saves time and helps in serving filtered results to your users. Are some of the events you want to display on your website, already on facebook? Then no need to create their listings manually on your website, just pull them with a single click. The Facebook events plugin is designed to let you display the facebook events on your own website, effortlessly. Besides, enable social logins on your event portal. You can use one of the third-party plugins such as OA Social Login you’ll be able to provide an alternative login method to your visitors. Let your visitors RSVP to the event of their interest. Both you and your users can confirm attendance of a particular event. Moreover, the users can log in and see a list of the event selected as attending, inside the user dashboard. 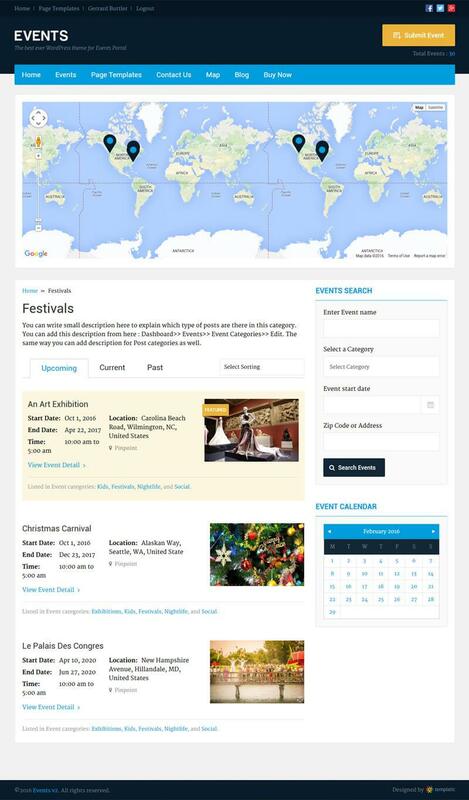 What kind of events websites can you create with this WordPress events theme? This flexible Events WordPress theme is flexible enough to let you create events website of any kind. 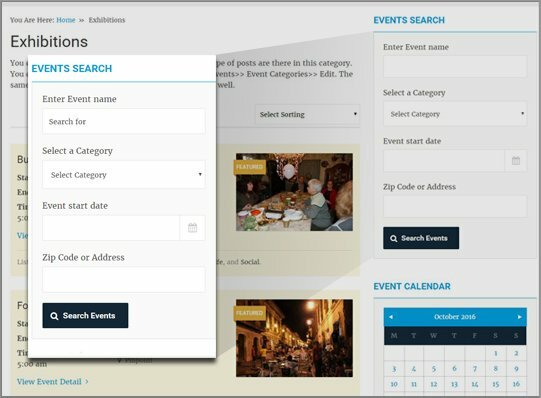 You can create professional event portal, with multiple event categories, or a simple website for local events. You can use this events theme for conference, concert, meetup, workshops, seminars, exhibitions and trade. Or you can create a website for an event management company. 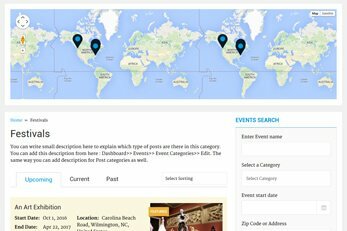 The events WordPress theme also lets you create a powerful, location-based, event listing directory. 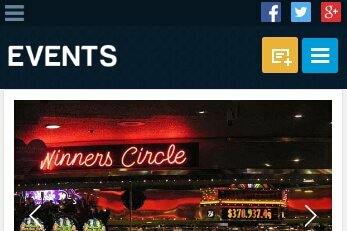 Besides, you can use this events theme for your church website, or any website like Eventbuilder, with features to sell tickets and RSVP. You can create an events websites that can translate into multiple languages using the WPML plugin. Moreover, for single language translation of your event’s website, you can use the provided .PO and .MO files. Display unique content with widgets such as: Browse by Categories, Top Agents, Finance Calculator, Featured Video, Contact Us, Twitter, Facebook, About Us. In case you ever run into problems, Contact Us and we’ll help you out. Is Events available as a HTML template? Yes, it is. From the “Advanced Settings” section in the theme back-end you can upload .csv files containing events and places data. Yes, it does. All Templatic themes work great on MultiSite, including Events. Along with the above gateways Events comes with two offline payment methods: PreBank Transfer and Cash. Can Events work with Open Street Map instead of Google Maps? At the moment this isn’t possible. Events was designed as a one-city theme. That said, MultiSite is always an alternative…. How can I sell tickets with this Events WordPress theme? You can integrate the event tickets plugin into your WordPress events theme to sell tickets through your event directory website. The event ticket plugin is easy to use and integrates seamlessly into your site. The events ticket selling module provides you an organized and effortless way to create events tickets and sell them online. How long can I use the events theme? You can use this Events WordPress theme forever, once you buy it. However, the support and updates for the events theme are limited to one year. One year after purchase, you can still use the theme without support and updates. How can I customize my WordPress Events theme? 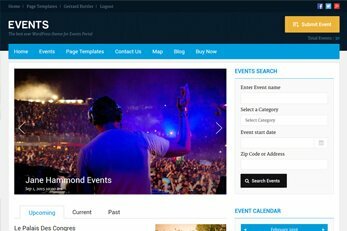 Customizing events website is really easy with all the options available at the backend of your events template. No coding required. 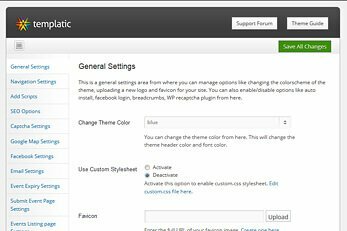 For advanced changes in the appearance of your Events WordPress theme, you can use the custom css to overwrite the existing format. Will it affect the performance of my event portal when I add excessive event listings? The performance of your website partially depends on your hosting. As far as this WordPress events theme is concerned, it is optimized for speed and performance. Can the events listings have a custom expiry date? Yes, the events submitted from the front end are bound to have an expiry date based on the events validity period. The event will be automatically unpublished when their validity period expires. Is there a separate plugin for the events calendar? The events calendar comes integrated right into your events theme. 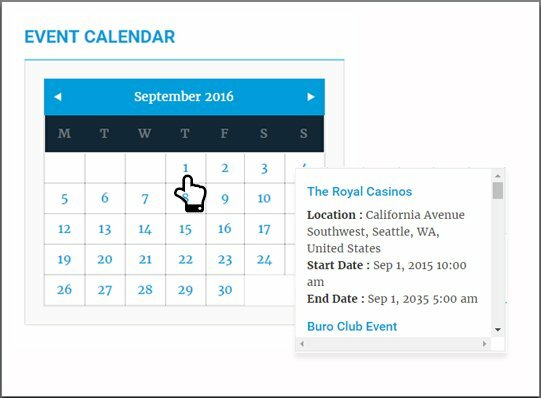 You won’t have to look around for an events calendar addon, or an events calendar plugin. However, it is totally up to your preference to show and hide the events calendar on your events website.